I can see her, she is the one, and I decide that she is going to be mine. There are a full nineteen ready and available to be tried. 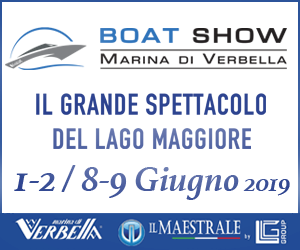 Boats, inflatables, fibre-glass or aluminium hulls, Italian ones and others from throughout Europe. We are on the quay at Baveno, on Lake Maggiore. 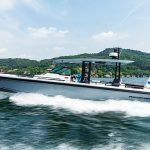 It is the presentation of the new range of outboard Mercurys, ranging from 150 to 400 hp. Amongst all of them, my eyes fall immediately upon this one, the Axopar 37 Sun-Top, which mounts two 300-hp Mercury V8s. It is a Finnish project, built in Poland and – above all – it is very beautiful. Of course any aesthetic view is always personal and subjective. 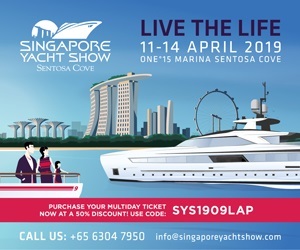 But it is difficult not to like this boat and it is no surprise that when I immediately tried to get a place on board, I had quite a struggle to get ahead of the competition of a thick crowd of journalist colleagues. The lines are distinctly Nordic, the Axopar 37 Sun-Top gives a nice feeling of sportiness and strength, but a lot of attention is also paid to design. 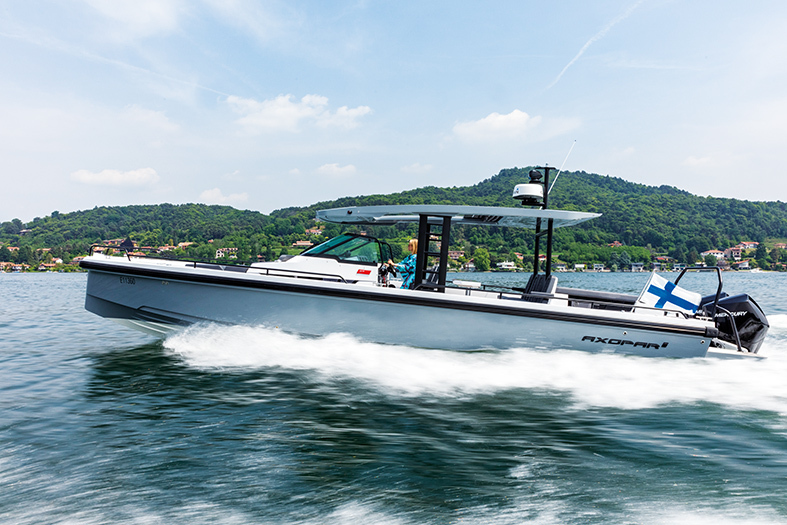 This Axopar has been created for hard sailing, and doesn’t fear the waves.The hull is fairly narrow, especially at bow, thanks to the twin stepped 20 degree V “sharp entry hull”. Two cabins are tucked away, fore and aft, but you don’t notice that when you look at the boat’s profile. There are two sun areas that remain below the level of the side, so this is a real open walkaround boat. The design of the long T-top is definitely well done, it covers the whole steering area, and the main central area with the dining table. The fibreglass masts are very nice to look at, strong and reassuring, and the electronically-operated fabric awning is cunningly done. 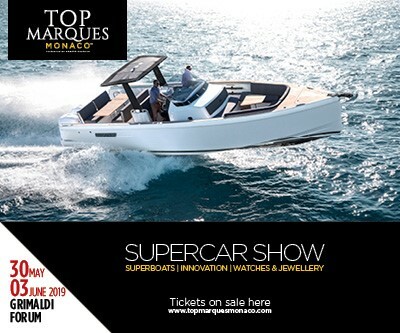 While trying out the boat, sitting next to me I had Jan-Erik Viitala, one of the two co-founders of Axopar, who really understands boats like this having previously worked with brands such as XO Boats, Paragon and Aquador. 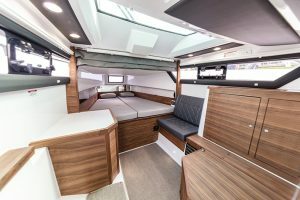 While I did the first few miles, he gave me a summary of what the approach to the boat was: «Speed, sea-faring quality, solid construction and a reasonable price». The 37 Sun-Top, like all the Axopars, is built in a modular way: various elements can be fitted onto the same hull, and these change the configuration of the decks and the interior. «Axopars are built using a traditional system. 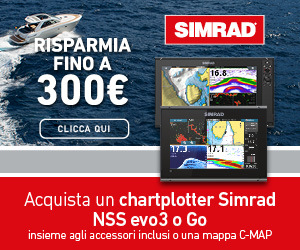 They need strength and dependability, you shouldn’t exaggerate on price and you have to be able to change the set-up according to the countries and seas where you are going to sail it». 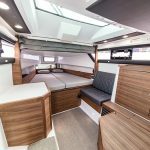 There is also a Cabin version of the AXOPAR 37 SUN-TOP, which has the whole of the central part covered, and with the option of changing the lay-out in the stern: with a second cabin underneath a sun lounger, like the one that we tested; with a bar counter and kitchen aft of the second row of seats; or without anything, with the cockpit completely stripped down. That would provide the perfect space to install a sterndrive engine. «We don’t even discuss that»,Viitala tells me flatly, «One of the reference points of our projects is outboard propulsion. To keep down weight, cost and to make maintenance easier». He has very clear ideas, and his formula is well liked: «We were founded in 2014, and since then we have made 1,000 boats. We have 500 orders just for 2018». The time to really try it out arrived, and I immediately appreciated the steering position: there are three welcoming, adjustable seats, with the throttles in the right place, and instruments that are easy to read. You immediately feel at home, so it was time to open the throttle right up without hesitation. In the stern, the two American V8s really give some thrust. It immediately starts, imperceptibly, planing. At 2,500 rpm there it goes slightly nose up, but the Axopar then immediately flattens out, not least because of the Mercury auto trim. I love narrow boats that line up well behind a wave and give you the feeling that they only have the propeller in the water. Top speed is just over 48 knots, and the two steps make it feel very light, and you can “fly” without problems, getting to 6,000 rpm. At that stage fuel consumption is obviously fairly notable: 186 litres per hour, so 3.86 litres per mile. But you just have to look, and you can easily find the right speed for you. For people who don’t want to use a lot of fuel and also sail some distance, that means not going beyond 3,500 revs at 24 knots. That is where the best fuel consumption figures lie: 2.58 litres per mile. 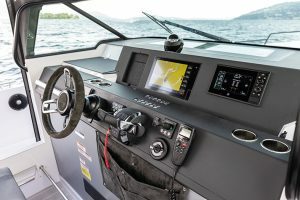 But people who are looking for the best fast cruising speed, at 38 knots fuel consumption is still more than reasonable, 115 litres per hour (3.02 litres per mile). 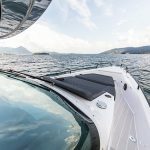 Another great benefit of the Axopar 37 Sun-Top is the precision of the hull. Tight turns, but never anxious ones, without running the risk of having children and luggage shoot off overboard. You really have to push things to the limit to make it lose revs by making turns that are too tight. And what about the waves? How does it behave, how does it react? 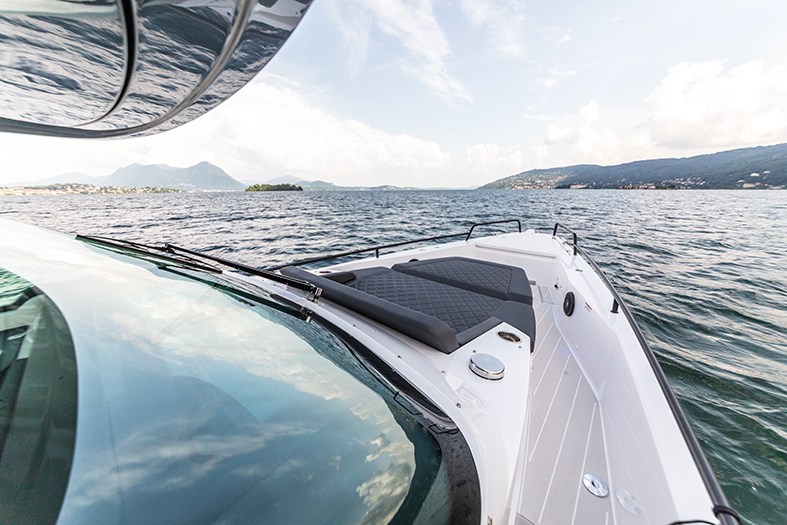 Unfortunately, Lake Maggiore isn’t exactly the Indian Ocean and, from this point of view, we weren’t able to force the Axopar 37 Sun-Top. 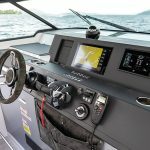 But we did go at full revs when tackling the waves created by other boats being tried out, and we appreciated the feeling of solidity that the boat always gives: the big T-Top doesn’t creak, and doesn’t move. Finally, a few words about the cabins. The one in the bows has a traditional V-shaped configuration, with a bed that is 200 x 160 cm, and is 166 cm high. There is a lot of light, a lot of wardrobes and space that is more than enough to move around comfortably. But the bathroom is not separate. 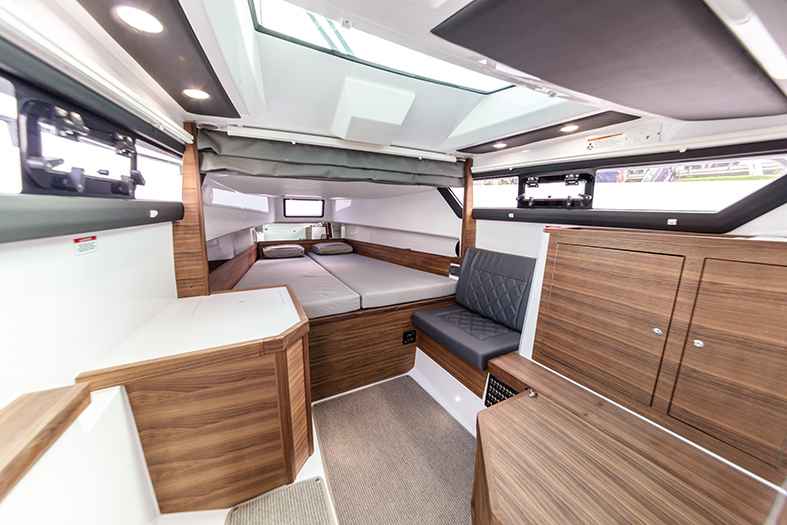 The one in the stern is definitely more restricted, not so much because of the size of the bed (192 x 160 cm) as by the height over the bed (90 cm) and because of the difficulty of getting into the cabin, by raising the entire mini-deckhouse, which is hinged on its aft side.